2325 NW 196Th ST has a Walk Score of 0 out of 100. This location is a Car-Dependent neighborhood so almost all errands require a car. Three Bedroom Home with All Appliances included! - Open floor plan. Kitchen with natural light, stained wood cabinets and black appliances. Perfect sized, fenced back yard. Neighborhood park, Swimming Pool and Clubhouse are located just a few houses down. 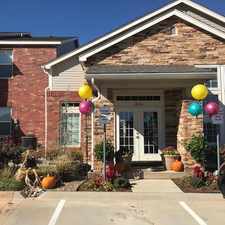 Explore how far you can travel by car, bus, bike and foot from 2325 NW 196Th ST.
2325 NW 196Th ST is in the city of Oklahoma City, OK. Oklahoma City has an average Walk Score of 33 and has 579,999 residents. Absolutely Fabulous Home in Edmond with All Appliances & Freshly Painted Interior!! Beautiful 4 bed Edmond Home!